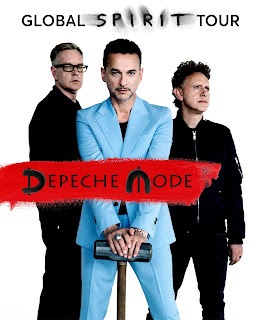 Many, many, months ago, the announcement of a world tour by Depeche Mode was announced. Along with the announcement, there was an effort to combat scalping with an exclusive pre-sale sign up to ensure 'real' fans were going to be in possession of tickets. Upon that effort, the general on-sale began and eager fans were able to acquire tickets. My contemplation to attend depended on ticket location (avid show attendee) and whether or not I could find somebody to tag along. Not that I require a companion due to my independent nature, but why not attempt? Well, not many friends or family members actually jumped at the opportunity. My quest to attend shows and concerts of artists that have shaped many different periods of my life (my bucket list shows) has already begun, and I shall continue the quest. Thus, this show had continued to be on my radar. Fast forward to 24 hours before the concert and those pesky reminders hit me like a ton of bricks. It was settled to find the cheapest ticket possible, and just go. Music has become my refuge from my personal demons (anxiety & depression) throughout my life, so it shouldn't have been so hard to decide. The affordable $30 tickets on the lawn (outdoor amphitheater) ended up being irresistible. Warpaint's opening set of original music was a delight. The band can really play, sing, and write beautiful music. What made hearing their music for the first time even better was the fact that it is the band is mostly female. Yeah, I failed to do my normal research beforehand, but it was a pleasant surprise. Depeche Mode's longevity is due to their great music and performances. This concert did not disappoint, and the set list of new and old was just what the doctor ordered. Thank you for coming to Phoenix on this tour! The experience was just spectacular!